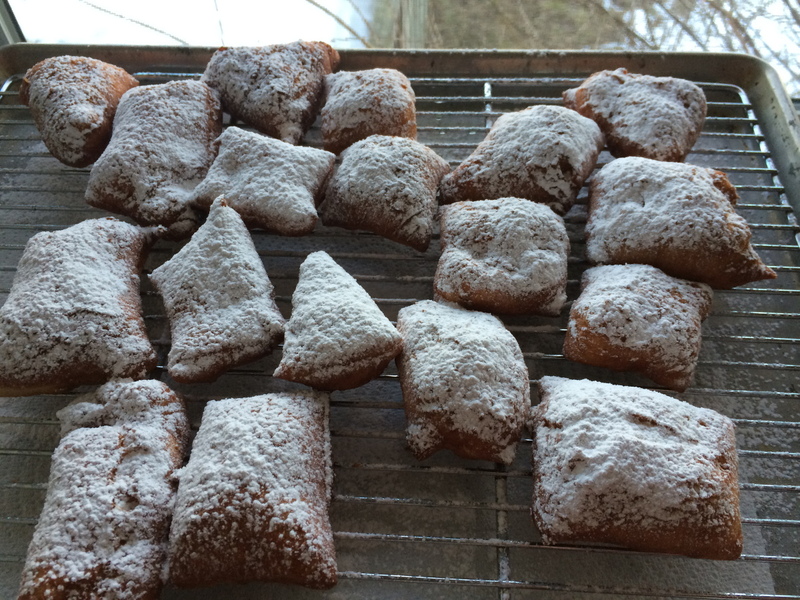 I had a recipe for beignets from Cook’s Country sitting around for about a year that my daughter would ask about every so often; “Daddy, when are you making doughnuts?”. Last week I finally took a look at it and realized there are minimal ingredients and it comes together quickly and easily. Combine water, yeast and 1 tablespoon granulated sugar in a large bowl and let rest for five minutes, until the yeast is foaming. Combine flour, remaining sugar and salt in another bowl. Whisk eggs and 2 tablespoons oil into the yeast and water mixture. Add the dry ingredients to the yeast mixture and stir to combine with a spoon or spatula until the dough comes together; it will be sticky. Cover and let rest in the refrigerator for one hour or until the dough has doubled in size. Add enough oil to a dutch oven to fill 4 cm and heat to 360 degrees; a candy thermometer that clips onto the pot works best. Line a half sheet pan with paper towel and put in a wire rack. Dust a flat surface, your hands and a rolling pin with flour. Pat out dough into a rectangle, then roll until about 1 cm thick. Flip over and lightly dust with flour. If your space is limited divide the dough in two first. Cut dough into whatever shape you’d like: squares or rectangles work nicely. I used a bench scraper for cutting and getting any sticking dough up. Smaller 6 cm squares are a nice sized treat. 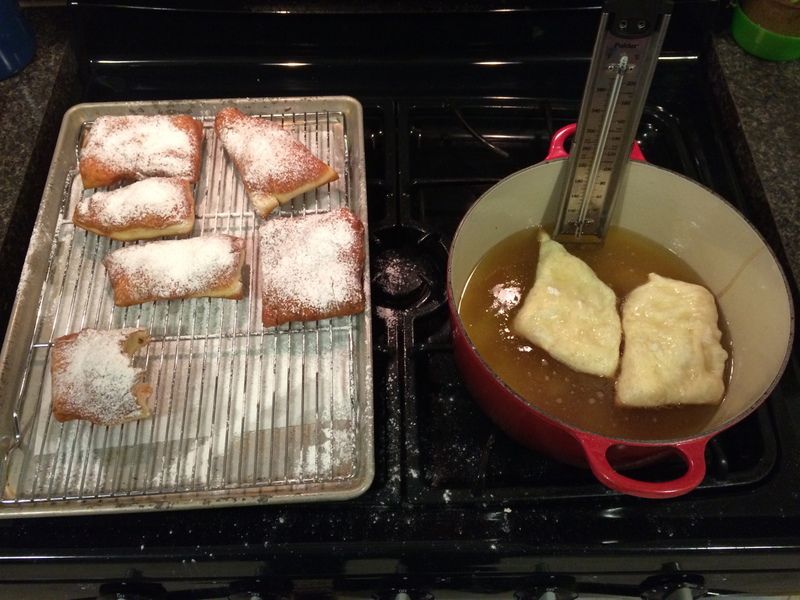 When the oil is at 360 degrees add enough beignets to not overcrowd the pot and allow them to move: five or six 6 cm beignets fit in my large Le Creuset pot. Flip when browned on the bottom, about 1-2 minutes. Remove when other side is browned, another 1-2 minutes. Place on wire rack and let cool for a few minutes, then apply a generous dusting of powdered sugar. Devour immediately. Are you can see in the pictures I tried different sizes and it worked very well. 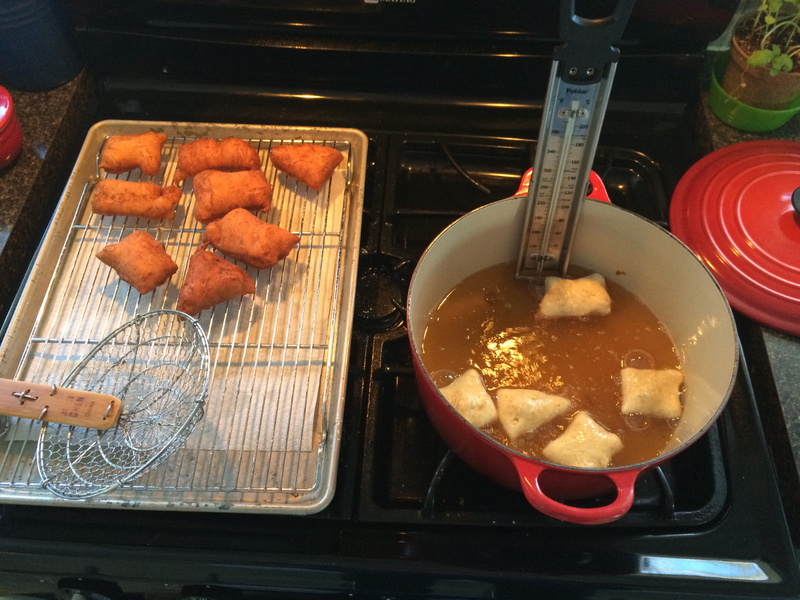 It comes together quickly: by the time the oil was hot enough the dough was rolled out and cut on my counter. Five minutes mixing and another fifteen cutting and frying gives a wonderful dessert or treat. The oil stays fairly clean so I suggest straining it and reusing for more beignets another five or six times.